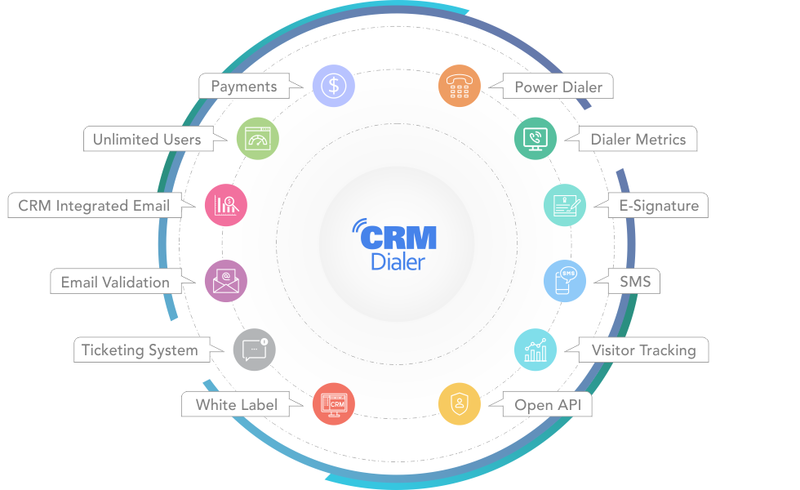 Officially launched April 2018, CRMDialer is a new, power-packed platform powered by IRIS CRM, an award winning CRM that provides a management platform to ISOs in the payments industry. Designed to provide a full-service telemarketing and CRM solution to businesses of all sizes, this sophisticated platform gives users everything they want and need with unlimited users. We know there are many CRM solutions available on the market. But we also recognize that many of the options out there are difficult to implement and short on the necessary tools for standout communication (like SMS and telephony). As a result, many businesses have to outsource their phone communication to apps and third-party vendors. And you know what that leaves? A huge gap in their customer profiles. That's why we created our revolutionary power dialer CRM platform. We saw a need out in the market, and we wanted to empower small and mid-sized businesses with innovative tools to boost their performance. We're no strangers to innovating. Back when Dimitri Akhrin founded IRIS CRM which was focused on the payment processing industry in 2010, he did so after seeing the lack of business management tools geared to the payment processing industry. He successfully created the leading system in the payment processing industry, and years later, the business is the market leading merchant services CRM, powering hundreds of businesses and delighting its clients. Most recently, IRIS CRM won the most prestigious 2018 ETA Award for outstanding Technology Innovation. So, when the team set out to create an enterprise-level CRM solution for small and midsize businesses across multiple industries, you can bet we brought the same drive, passion and client-first ideology to the table. As Akhrin describes it, "CRMDialer takes all the sales, marketing and support functions of enterprise solutions, adds flexibility and integrated communication tools, and makes them available to organizations of all sizes at an affordable cost. CRMDialer helps its users communicate and collaborate more effectively, close more deals and work better together." Dimitri Akhrin is the president of both IRIS CRM, the most advanced independent payment processing CRM on the market, and CRMDialer, a sophisticated telemarketing platform for small and mid-level businesses. He is passionate about sales leadership, keeping clients happy and how the future of CRM is evolving. Dimitri founded IRIS CRM in 2010 and CRMDialer in 2018. With more than 17 years of industry experience and a deep understanding of being a hands-on manager, Dimitri is a recognized leader in the payment processing and Software as a Service (SaaS) CRM space. He is a problem solver and identified a gap to create a business management system capable of communicating with multiple payment networks. Dimitri truly understands specific pain points that Independent Sales Organizations (ISOs) experience while developing technology systems and how to create tools to address their unique needs. After years of careful research and development, IRIS CRM was born and today the company serves more than 100 ISOs and even powers CRMDialer’s software. Prior to IRIS CRM, Dimitri founded BAMS.com. He has served as president of the company for more than 12 years and continues to oversee the day-to-day operations of the full service electronic payments solution provider. Dimitri holds a Bachelor's degree in Business and Technology Management from New York University's Tandon School of Engineering. Jaron is an expert at delivering enterprise-level support and spends his time onboarding and training clients, providing software support and testing new features. Jaron also works with the development team to design a fluid user experience. Amber has more than 15 years of analysis experience with her proficiency being advanced techniques for cleaning and managing data. Amber leads residual payment implementations for clients and also provides expert technical support. Jason has worked in the credit card processing industry since 2008 and has built many successful relationships. Born and raised in Brooklyn NY, he is a huge Philadelphia Eagles fan (weird, we know) and loves all things football. Gary is a 5-year recruiting veteran in the financial technology space. He is responsible for aligning business objectives with employees and management in designated business units. Gary is a perfectionist who loves to multitask projects, Beat Box and eat peanut butter. Leonid has more than 10 years of software development experience and leads new processor integration at IRIS CRM. Leonid is a math genius (although he will not admit it) and has the capacity to quickly solve complex problems involving large datasets. Jordan brings more than 16 years of experience in the credit card processing industry. Having worked for companies such as Lipman USA, EVO and Harbortouch, Jordan has a well-rounded background pertaining to the operations of a merchant services organization. Ivan has more than 10 years of experience providing digital marketing and e-commerce solutions. Ivan loves being creative and improving social media channels and planning new marketing campaigns. David is an IT specialist with a long career focused on client support services. He works with clients to implement processor integrations and improvements to merchant portfolio management. Levi has two decades of experience working with customers and leading support teams focused on Point of Sale and Payment Processing. He has worked for companies including Groupon and Upserve. Mario has over 10 years of inside sales experience in the IT sector. His many skills include sales and technical writing and data processing. Mario thinks that "An SQL query walks into a bar, sees two tables and asks them, may I join you?" is funny. Anton operates in CRM sales and provides tailored offerings for the small business market. In his spare time, Anton enjoys to cook, read novels, and watch films about historical events. Alina is interested in the IT industry and especially in the field of quality assurance. She takes great pride in her work. She is really keen on video games, reading books, and traveling. Vlad is responsible for software testing, performance, and usability. Vlad has an eye for attention to detail and knows that anything can be achieved when collaborating as a team. Alex is a perfectionist. He loves learning new things all the time. He likes rock music, fantasy & sci-fi books, and movies about historical events. Pablo has more than 7 years of software development experience and always strives to find the simplest yet most effective solutions to complex problems. He focuses on leading the integration efforts of new payment processors and IRIS CRM. Giorgi has more than 10 years of software development experience. He has a vibrant passion for AI design and business intelligence insights. Giorgi hopes to one day develop an algorithm to choose tomorrow's winning lottery numbers. Gary built the page that you are currently reading. He works with the design and marketing teams to implement UI and UX designs. In his free time, Gary enjoys reading books and watching nature documentaries. Sam's specialty for the last 10 years is focusing on the latest UI and UX trends and creating intuitive interfaces. Sam's purpose is to achieve 100% user satisfaction from an attractive and easy-to-understand CRM workflow. Igor brings more than 6 years of development experience. Igor is a curious individual, self-motivated and loves to provide added value by contributing his vision into projects. Igor loves to organize events and sings for pleasure. Igor has more than 5 years of commercial software development experience. His specialty is in the implementation of server-side components and API integrations. Igor is aspiring to grow his knowledge base as a full-stack developer using the latest technologies. Nikolay is a dev ops and system administrator for more than 10 years. Nikolay is passionate about automation, cloud services and container technologies. Nikolay is a certified Scrum master preaches about working in an agile manner. Ruslan focuses on back-end development and brings almost 5 years of experience to the team. Ruslan likes learning about new approaches in development. Ruslan loves watching scientific videos about the universe and history. Ruslan stays active by being an avid hiker and basketball player. Joseph has about 4 years of experience working in the software development industry. He is very detail oriented, enjoys learning new technologies and solving algorithmic equations. Joseph loves playing sport; he often plays soccer and participates in marathons. Konstantin is a DevOps engineer who's obsessed with coding and automation. He follows modern technologies and is obsessed with Hashicorp products, Kubernetes, Docker and Configuration management tools. Sergey is a DevOps Engineer with over 10 years of experience in the IT industry. He considers himself a technical geek with a passion for studying new technologies and devices. Sergey loves hiking, riding his bike and having an active lifestyle. Alexander has 9 years of commercial software development experience. He specializes in the implementation of back-end technologies. His hobbies revolve around books and electronics. Oleh started coding eight years ago and has made it one of his life's passions. He enjoys solving interesting problems and learning new things every day. Oleh loves to travel and spend time with his family.